I am heading off for the Netherlands tomorrow – the flight is 8 hours, 15 hour stopover and then12 hours so for that time obviously I will be unavailable inworld or to answer customer questions. 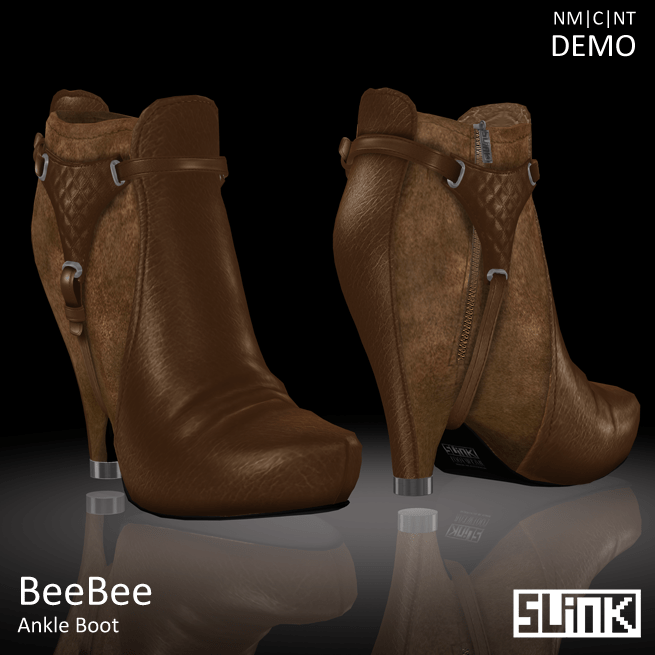 BeeBee Boots limited edition offer! I have created these special festive edition BeeBee Boots and popped them up in the SLink Mainstore for the very low price of $150L until 11:59 on Xmas Eve. After that, they are gone, gone gone!! Available in White, Black, Red, Magenta and Teal! Resolved – BeeBee boots delivery issues! It seems that SL was having happy fun non-delivery times last night, after I released the BeeBee Boots, and of course, after I went to bed at 2am. A few people didn’t receive the Tan boots, either from the box, or in the fatpack, which is weird, because I definitely put them in there! Anyway.. I am resending all those who didn’t receive that item and hopefully you who bought the tan boots will be able to enjoy them as soon as possible! well.. It’s Wednesday for me 🙂 So er.. Happy Wednesday! Brand new gorgeous boots. These have taken me hours, and hours. Sculpting and resculpting, texturing and retexturing, getting them perfect and I’m very proud of them and love them to bits! Grab a free demo at the SLink Mainstore. BeeBee Boots now available. Click below for a larger image!